As the mercury plummets and the chances of snow grow greater, the last thing you want to have happen is getting stranded because of a dead battery or getting into an accident because you can’t see out of your windshield. If you haven’t taken the preventative steps to avoid such situations, you better get on it right away. The challenge of owning a car in the winter is real. Freezing temperatures and heavy snow make even the smallest problem with your car so much worse. It is one thing to have to change a tire in July, it’s a whole different deal when you have to do it during a snowstorm in January. Cold temperatures and very short days make those types of tasks ones you really want to avoid. 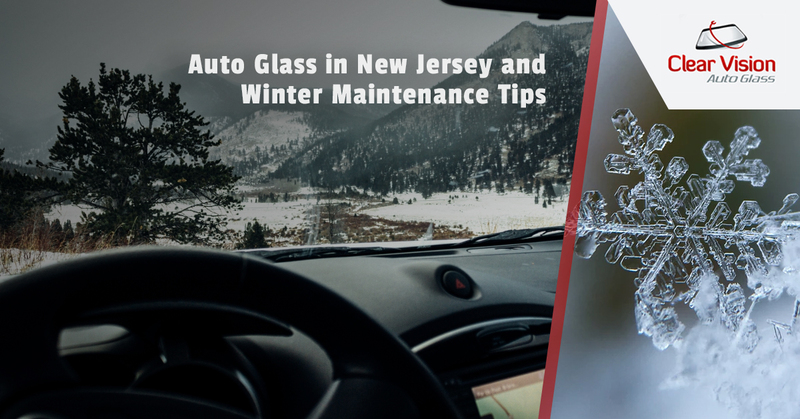 Clear Vision Auto Glass, your auto glass shop serving New Jersey, offers winter maintenance tips that will make your life easier. You can bet that small crack in your windshield will expand in the cold winter months. It might even become a hazard if it affects your vision. Now is the time you want to have it checked out and repaired. It is important to check the air pressure in your tires now and on a regular basis throughout winter. Air pressure can drop as the temperatures do and driving around on low tires will wear them out prematurely. It is also important to check your tires for wear and uneven wear. It is a good idea to replace your all-season tires with winter tires as they are made to grip slick surfaces. More often than not, you will suffer a dead battery in the middle of winter. A battery that is weak in the warm months of summer will surely fail on you when the temperatures plummet. Take your battery to your mechanic or to an auto parts store to have it tested and replace it if necessary. Nothing is worse than getting stranded with a dead battery. Coolant, otherwise known as antifreeze, is very important to your car in the winter as it keeps your engine from freezing when it is cold. Make sure that your car has plenty of antifreeze and that you don’t have any leaks. Washer fluid and gasoline are two automotive necessities that you need to keep full in the winter. A full tank of gas prevents water from freezing inside your fuel pump and will allow your engine to run for a long time and keeping you warm should you get stuck in the snow. A full windshield washer reservoir is important for keeping your windshield clean and clear from messy road debris when it snows and is otherwise wet. We don’t care if you just bought wiper blades in the spring, it’s time to change them out again. Wiper blades are made of rubber and are susceptible to damage from the elements. They have been literally baking in the sun all summer and should be replaced right away. It is important to check the oil and ensure it is at the right level. Cold weather thickens up oil and makes it difficult to turn over the engine, so you should be using a viscosity oil with a “W” formulated for winter use. If it has been a while since you had an oil change, put that on your list of things to do. Make sure you have an emergency kit in the truck in case you do suffer a breakdown. Right now is a good time to contact Clear Vision Auto Glass and have that windshield inspected and repaired.